While travelling, staying in a relaxing hotel makes the experience more fun. InterContinental Hotels Group (IHG), one of the world's leading hotel companies are on a mission to help guests get a better night's sleep with the launch of their Snoozapalooza promotion at Holiday Inn Express®. They have extended hours on both breakfast and check-out times until noon every weekend until December 18, 2016. Every room as a sleep book titled Bring Your Zzzz Game that illustrates tips on how to get a good night's rest. Since research continues to point to the importance of sleep quality on health, wellness, and daily productivity, the Holiday Inn Express brand wants to ensure their guests are well-rested. They follow a five point scorecard to evaluate the guest's quality of stay including: bed comfort, noise levels, room temperature, lighting and the cleanliness of the suite. During our travels past summer to Sault Ste. Marie, we chose to stay at Holiday Inn Express as it is conveniently located to many attractions. 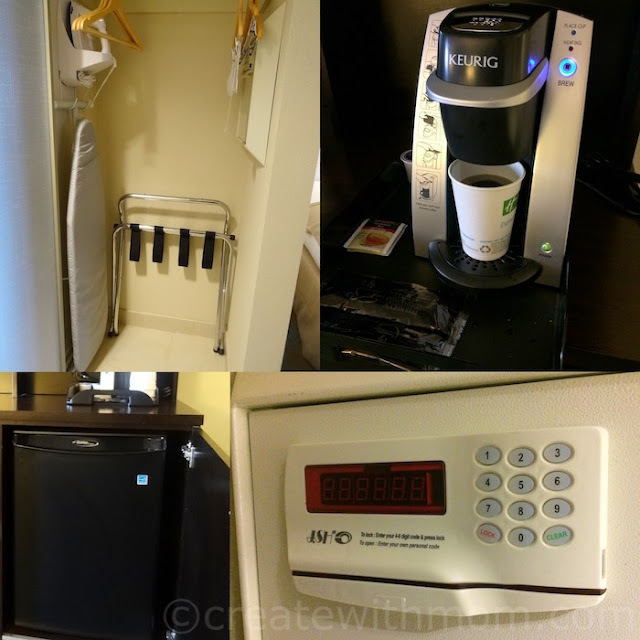 Having modern day conveniences such as a coffee machine, ironing board, microwave, fridge, a safe within the room, and WiFi is useful when travelling. 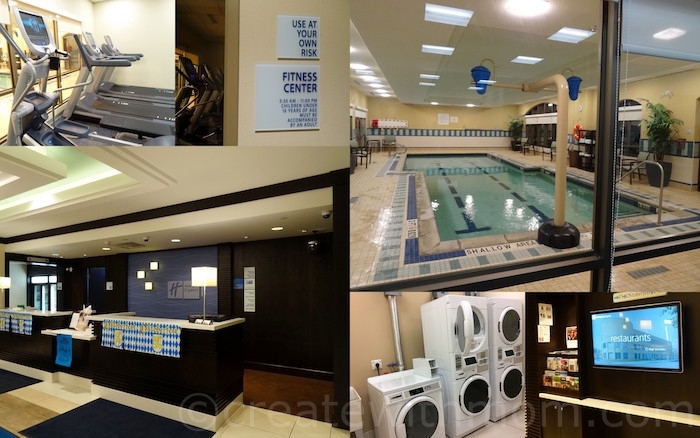 I also like that the hotel has a swimming pool, fitness room, laundry room, and a business space with access to a computer. During our recent stay at the Holiday Inn Express at St. Jacob's in Waterloo, Ontario we felt well rested and relaxed. 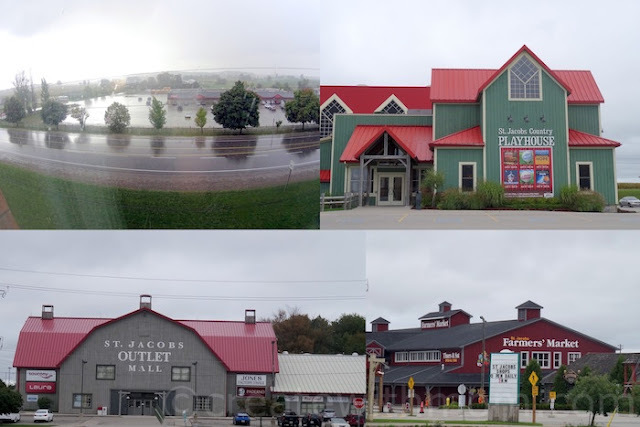 While driving from Toronto to Waterloo, we stopped to enjoy the bounties of the season by visiting farms, going apple picking, and exploring the Halton, and St. Jacob's area. We went to visit the Halton County Radial Railway museum, which has lots of changes and new exciting things to do since our trip a few years ago - more about the museum on our post here. We also explored the St. Jacob's area mall and market while there, but spent lots of time at the hotel as we took advantage of the fitness room and enjoyed being in the room. For us being able to check out at noon is a relief, so we didn't have to rush or wake the children up early for breakfast. It is just fun to wake up late on weekends! 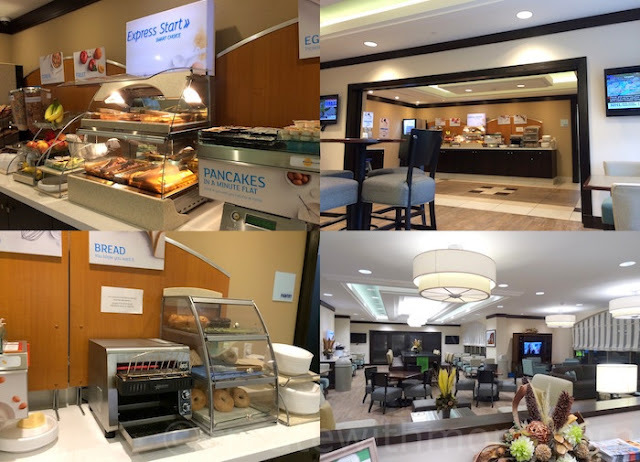 I also like that we can enjoy a complimentary hot Express Start™ breakfast that offers a variety of hot and cold options such as fresh cinnamon buns, plus the Holiday Inn Express brand's one-touch pancakes. We sleep better in a dark environment. Make sure your shades are fully closed for complete darkness. Blue light from TV, mobile phones and laptops can interfere with sleep. Try shutting down all devices an hour before you head to bed. Cool down, and wind down. Most people enjoy a cool night's sleep. Adjust the temperature between 15 to 20 degrees to create a cool sleeping environment. Also take some time to stretch after a long day. Get comfy. Check out the Holiday Inn Express® pillow menu. They have choices from Firm to Soft pillows. Release your inner chatter. Some of the best ideas come when we lay down for the night. Use a notepad to get them out of your head to paper. Find your ideal position and relax before bed. Take time to wind down from the day by doing a relaxing activity such as colouring or reading. In Canada, there are 94 Holiday Inn Express hotels from coast-to-coast with 16 hotels in the pipeline. The Snoozapalooza promotion is also happening in Holiday Inn Express hotels in the United States and Mexico. Take a break from your routine and enjoy some relaxing time at Holiday Inn Express! What a great place to stay during a vacation. I love that it has free breakfast. I have stayed at Holiday Inn Express a number of times. Lots of memories. Thanks very much for terrific review & pics, I didn't know about the Holiday Inn Express Snoozapalooza promotion on weekends. Another huge bonus is the microwave in the room, plus breakfast is included, that's awesome! We have stayed in a Holiday Inn and it was a great Hotel and would stay there again. They always have such nice rooms. Reasonable rates as well. What a nifty place - I love the idea of not having to rush to get out the door during a weekend stay! What a beautiful place to stay! Holiday Inn Express are nice hotel with good rate! Love the Holiday Inn! Great chain! 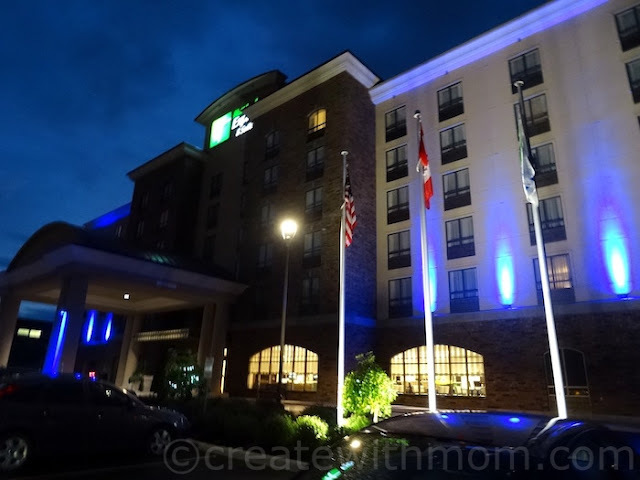 We have always enjoyed our stays at Holiday Inn Express! We love staying at the Holiday Inn Express.. We enjoy the free breakfast. Looks awesome. Haven't stayed in any hotels in a long while. Thanks for sharing. Looks like a lovely hotel to visit. I'll keep a mental note. We have always been impressed when we have stayed at a Holiday Inn Express. It looks like a nice clean place to stay.